A wise wag once declared that health was “the slowest possible rate at which to die”. Fine as far as it goes, but it does err slightly on the negative. 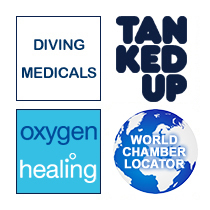 The World Health Organisation prefers this: “a state of complete physical, mental, and social well-being, not merely the absence of disease or infirmity.” So how can we apply this to diving? Any of you who’ve had your medical with myself or Jules might fondly recall our cherished step test box, which can reduce your fiercest sat diver to a wibbling heap in under 5 minutes. Our intent is not to humiliate (although it does somewhat sate one’s sadistic tendencies), but to illustrate the importance of some semblance of cardiovascular fitness to diving. One of the sports’ strange paradoxes is that we spend a lot of time trying to relax, breathe slowly, hang gracefully and neutrally buoyant and generally expend as little energy as possible underwater. So how physically fit do you need to be to do this? During an uneventful dive, not particularly; but it’s the before and after, and sometimes during (if equipment fails or buddies get into trouble), that can put sudden and intense demands on us. Think gearing up, dekitting, finning furiously in unexpected currents… Your fat, 50-a-day diver may be fine drifting in calm water, but short, hard bursts of exertion might easily sink them with an arrhythmia from a heart unable to cope. Contrary to popular belief, diving itself doesn’t make you fit – in general there’s more calories going in than out, and all that sitting about on RIBs outweighs the odd bout of gentle finning. So a bit of extra work’s required. Distant memories of finishing a half-arsed cross country run at school won’t cut it, as sadly, fitness can’t be stored – the old adage of “use it or lose it” applies. But the benefits are huge (see box). Anyone looking to become a better diver, extend their bottom times or take on more challenging diving should put fitness near the top of their “to do” list. Just under “stop smoking” (which shoots straight in at number 1) and “lose weight” (which will usually be part and parcel of exercising). There’s not enough room in my meagre double page spread to go into the specifics of a cardiovascular workout, and anyway it’s better to tailor a programme to suit your individual needs. Fast walking, running, swimming or cycling are all fine variants – as well as getting the ticker pumping, they will help develop flexibility, tone and strength in the core muscles of the back, abdomen and legs. A few minutes warming up (with eg. some star jumps, jogging on the spot) followed by stretches of the limbs and torso are always advisable before the hard stuff of press-ups, lunges and crunches. Alternatively, jump on your Wii Fit Snowboard and carve for an hour - a good way to build up the quads. And remember a short cool down at the end. After a mothballed winter layoff it’s probably not the best idea to tackle that 100m wreck in the inky blackness for your first venture (even if it is full of lost bullion) – it sounds obvious but I’ve seen bends occur as a direct result of simply biting off a bit more than is chewable early on in the season. A few easy shallow dives in known waters will help to smooth the passage back to fitness, and allow you time to get used to the quirks of the shiny new reg and computer you unwrapped at Christmas. Finally, pre-dive exercise and its potential to reduce DCI risk has been a vogue topic in recent years. Large decreases in bubble counts were seen in fit military divers who ran for 45 minutes 24 hours before, and in another study, 2 hours before diving. How applicable this is to your average, ah, “well-built” UK specimen is up for discussion (perhaps a few warm up stretches are more realistic than a 45 minute run), but the principle has been shown in several different studies. More controversial is exercise after diving – some claim it speeds bubble clearance, others that it might increase bubble formation. I’d steer clear of the gym straight after a dive for now. The roof’s blown off, the MOT’s overdue, teenage daughter is going out with a pierced freak from hell and the drysuit’s sprung a leak… Psychological health is often overlooked but is equally as important as our corporeal condition. Although diving can be a big stress reliever, anxiety or longer term conditions such as depression can cause instinctive and dangerous behaviours underwater - breath holding, removing dive gear, uncontrolled ascents etc. It’s always a good idea to give yourself a quick mental check-up: “Am I in the right frame of mind for this dive?” One of the big benefits of breathing exercises and yoga is their ability to focus the mind – you can take plenty of lessons from freedivers on this. More often than not this involves that well-known lubricant alcohol, in varying and often substantial quantities. The post-dive debrief wouldn’t be the same without a few cold ones. Flippancy aside, the perils of over-indulgence are many, though: dehydration, clouding of judgment, slowed reaction times, poor co-ordination, impairment of self-control and diminished inhibitions. Not to mention the shocker between the eyes afterwards. Keeping a lid on the booze in the run-up to, and during, a series of dives is safer all round. Bacon butties, beers and between-dive chocolates do not a fit diver make. You didn’t expect me to say anything different, did you? If you want to put your body into the high pressure, alien environment of the deep, probably best to feed it some fuel it can work with effectively. Ideally this needs to be done a few days before diving. Carbohydrate loading should be of the healthy variety – rice, pasta, veggies – and get some protein in there too – lean meat, fish, beans. Steering clear of fatty foods will help avoid that heavy-stomached lethargy on dive day. Hydration is key – the golden rule is to keep your wee copious and clear. Much like equalising, the best way to hydrate is “little and often”. Sipping on bottles will spread the intake of the 2-3 litres of liquid you need over the course of a day. Diluted juice is better absorbed than plain water, and if the squits are in full effect then rehydration salts are better still.